When the platypus was first discovered in Australia, European settlers thought it was fake. You can image why. No other animal has a duck-bill, a beaver tail, otter feet, and lays eggs. They’re also the one of the only mammals with venom. A platypus in Tasmania, by D. Watts/Visuals Unlimited/Corbis. The platypus belongs to a group of mammals called Monotremes. This group has 5 living species in total, the platypus and 4 species of echidnas. All five of these mammals lay eggs and none have teeth. Monotremes are the most basal group of living mammals. All the species of living monotremes. From Redbubble. 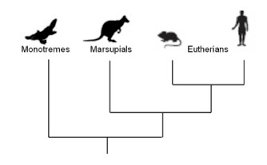 A simple phylogeny (evolutionary tree) showing the relationships of the living mammals. 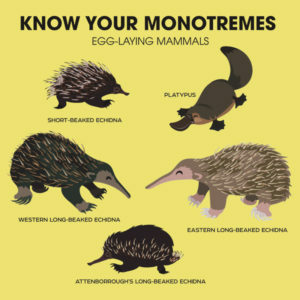 Monotremes lay eggs. Marsupials have pouches. All Eutherians give birth the same way humans do. The platypus swims in rivers and uses its bill to sense prey in the muddy bottom with electroreception (sensing the electrical current of animals) and mechanoreception (the sense of touch). Did extinct platypuses use the same senses? A new [article] examined the skulls of modern (Ornithorhynchus anatinus) and one extinct platypus (Obdurodon dicksoni) to try an answer that question. The authors CT scanned and created digital models of the skulls. Then they used a statistical technique to analyze any shape differences in the skulls. 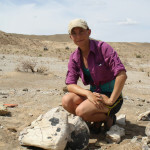 They found that Obdurodon has larger eyes and still has teeth. Interestingly, the bill of Obdurodon points slightly upwards relative to the back of the skull. In contrast, the living platypus has smaller eyes, no teeth, and the bill points more downwards. Figure 1A from the paper. The skulls of the modern platypus (left) and the extinct Obdurodon (right) showing how the bill of the platypus points more downward and the bill of Obdurodon points more upward. One last feature they looked for is the infraorbital foramen. The infraorbital foramen is a hole in the skull below the eye socket. This hole allows the nerve for sensation of the face to travel from the brain to the bill. 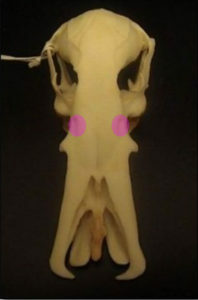 A platypus skull with the infraorbital foramen highlighted in pink. We have these, too, and in us that nerve sends information from our face to our brains. 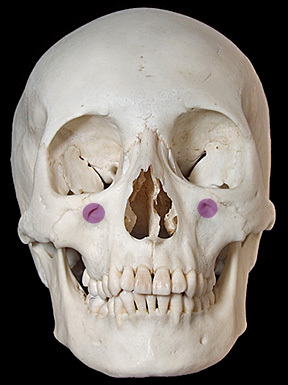 A human skull showing the infraorbital foramen in purple. The size of this hole is directly proportional to the size of the nerve. So examining the change in size can inform us about how much sensation is traveling from the bill to the brain. Remember I said the living platypus uses special senses to hunt for prey? Those special senses use this nerve to relay the information to the brain. So a sudden enlargement of the nerve can tell us when these special senses evolved. And that’s exactly what the authors found. The extinct Obdurodon still has teeth, which limits the size the infraorbital foramen, and the nerve, can be. The modern platypus loses its teeth so it can expand the infraorbital foramen. This allows for a larger nerve and more sensation. Figure 3B and D from the paper. This shows two sections through the snout of the modern (right) and extinct (left) platypus. The infraorbital canal is smaller in the extinct platypus. The size allows teeth to still grow. The modern platypus has a larger canal, so teeth do not have space to grow. This means that in the past, extinct platypuses (like Obdurodon) used their larger eyes to hunt for prey that was swimming around. 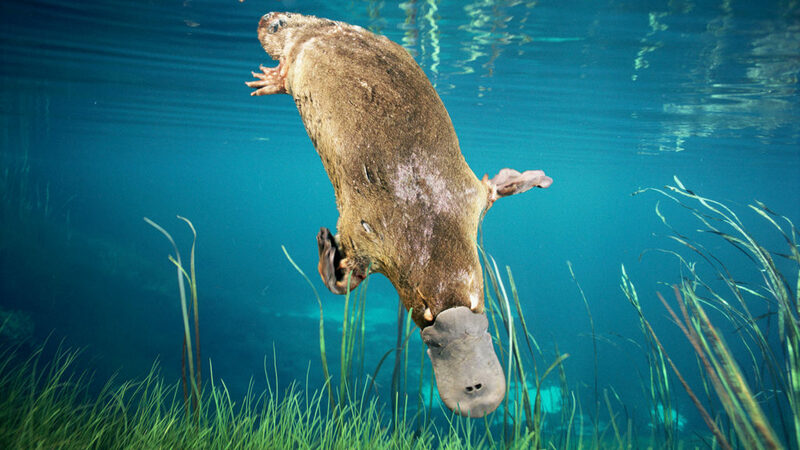 Modern platypuses instead use their special senses and downturned bill to dig up prey in the muddy bottoms. As they dig up the mud, the water becomes dark, so vision is less important. They actually close their eyes to hunt! The modern platypus is one of the strangest mammals around today and because of this study we know a little more about how it evolved. This entry was posted in English and tagged Anatomy, Infraorbital Foramen, Platypus. Bookmark the permalink. There are a few other venomous mammals, including a few species of shrew with venomous bites, and some have argued vampire bat saliva should be considered toxic. The platypus is the only one that injects it through ankle spurs though – but to be fair, it’s one of the few extant mammals that still has ankle spurs at all. Ahh, very good. Thanks for pointing those out!